The last time a non VW Group model was #1 in Austria was in July 2005 (Opel Astra). After artificially lifting 31.3% in August due to pre-WLTP stock clearances, the Austrian new car market is logically – but particularly harshly – down 41.8% in September to 17.194 units, leading to a year-to-date volume up 2.2% to 275.958. Volkswagen (-58%) falls much faster than the market but, unlike in neighbouring Switzerland (Mercedes) and Germany (BMW), manages to retain the brands pole position at 10.5% share ahead of Skoda (-32%) at 8.7% and Hyundai (-36%) at 8.5% with Ford (-13%) at 8.4% and Opel (-30%) at 8.2% also following very closely. BMW (-7%), Peugeot (-11%) and Kia (-19%), marques that did not need to rush registrations of non WLTP-compliant models in August, post the best holds in the Top 10. Further down, Jaguar (+28%), Citroen (+8%) and Volvo (+6%) are the only Top 30 brands in positive with Subaru stable. 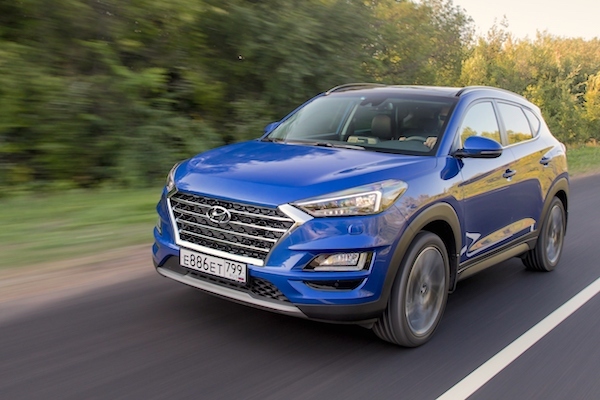 Surprise in the Austrian models ranking: the Hyundai Tucson (+89%) spectacularly takes the lead with a mammoth 4.8% share, 53% above the #2, the Skoda Octavia (-41%) while the VW Golf (-77%) implodes. This is the first time in 6 years that the VW Golf isn’t the best-selling vehicle in Austria: the last time was in October 2012 (VW Tiguan). Even more momentous: it is the first time in over 13 years that a non-VW Group nameplate is #1 in Austria, the last time was in July 2005 (Opel Astra). The VW T-Roc rallies back up 11 spots to #4, its new ranking record in Austria eclipsing the #5 it held from April to June, while the VW Polo (+171%) takes advantage of its new generation and the Skoda Karoq breaks into the Austrian Top 10 for the first time at #10. Full September 2018 Top 45 All-brands and Top 280 All-models below.